Ask for Pro-se,Professional Paralegal;Student of law; 15yrs.top notch expertise in such field Legal Research; when ready to sue by method of pro-se eslf file,before deadline caseworker.cps. heather-marie ext. 102. NJ that"her day shall come"per violation for money damages"
and victory for child,two daughters,and herself. to continue reminding;giving hope to the "truly innocent. GOOD AMERICAN FAMILIES VIOLATED"to sue. your violation finally begin to CEASE. ext. 102. AS THE TIME IS "ALWAYS RIGHT"to do what is right. LOCATION: NEW JERSEY NEWARK,NJ VICINAGE 3RD DISTRICT. FEDERAL MAGISTRATE,AS MEDIA IS ABOUT TO RELEASE STORY ON A SUBURBAN LOVING MOTHER,(our boss! )Melendez,and her beautiful 2 girls,were brutally,nefariously mistreated for years . . .
Boss started her own pro-se SELF FILE actionable claim resource network,for years now to ensure"ALL"who are(truly)violated able to hold CASEWORKER at UNION COUNTY,ESSEX,MORRIS,Cumberland AND ALL 21 COUNTIES IN NJ ACCOUNTABLE,simple as that if you had lost a child,who was brutally raped,sexually abused,drugged & or hospitalize,suicidal,and yet"Caseworker"had EVERY opportunity to tell the"truth"about the POOR condition child was in;and just return child but CHOSE NOT TO,premise on utilizing fraud on the court to see to it,the child will NEVER EVER RETURN back home,unless dead,and or to be further raped,sexually abused,beaten. DYFS OF NEW JERSEY ATTEMPTED TO UNDERMINE HER life and indeed has forever,irreparable harm,is evident,pending in the Federal Court. . .
"such happy american good parents,raising right such per child deserve to be able to smile finally"once again when they hear the news of a lawsuit in THEIR FAVOR in FEDERAL COURT has moved forward and not dismissed!. (READ MORE at our popular facebook,sue cps in federal court. )and Congratulations again to our own staff member,whose won such right to move forward end of summer 2013,with her lawsuit against abhorrent dyfs workers,multiple and supervisors et;al. FALSELY ACCUSED CARETAKER,LOVING PARENT FEDERAL MONEY DAMAGES CIVIL RIGHT,PRO-SE SELF FILE lawsuit has move toward the finish line! ( when your in a "game"called,"Taking back Your right,your family) from cps,most important? taking back your LIFE, your your dignity and your happiness!" just prior"assume"he or she can just "Come on in"and interrupt your home? To get away with confiscating,detain,and just steal your child..."
WELL, AS BELLA'S LAWSUIT PROVE TODAY. TO GET STARTED WITH HEATHER-MARIE SAME DAY! SHE IS AT EXT. 102 DAILY.AND GOOD LUCK TO YOU ALL . . .
AND FOR FOSTER CHILDREN LOOKING TO SUE PRO-SE SELF FILE BY DEADLINE CHILD PROTECTION SERVICES. Caseworkers only get away"with the, intentoinal-inflication of emotional distress,per child,and yourself suffering,by such worker direct misconduct,perjury to materiality;fact,to the intentional fabrication;for ONLY SO LONG,as proven by boss lawsuit,if your not suing?THIS VIOLATION,AND SUCH PAIN CAUSE BY CHILD PROTECTION CASEWORKER,whether here in NYC,NJ TRI-STATE to VA. to NC. ; CALIFORNIA,TX DFPS,TO WASHINGTON,OREGON DHS,TO ARIZONA ADES;Nationwide cps caseworker violations shall sadly continue,UNTIL YOUR SUING... No more excuses; why your still NOT taking back your right,and holding CPS accountable.ext. 102. 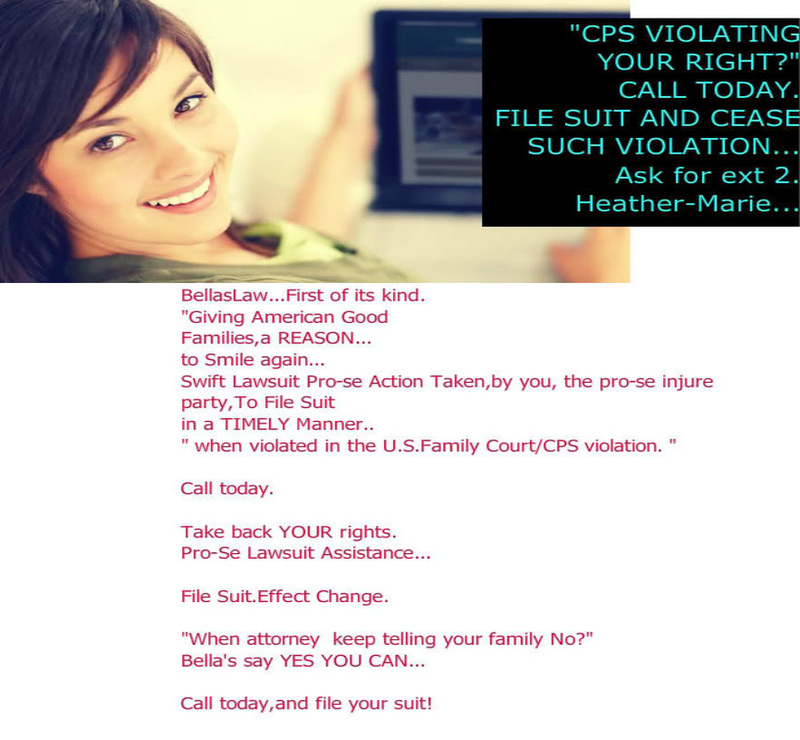 Ask for heather-marie rothstein,publicly recommended,to begin the same-day of your free informative consult,and we thank you for visiting BELLAS LAW STUDENT'SUE CPS PRO-SE NETWORK FOR THE"truly innocent" ... 1-855-602-5557. WHEN LAWYER DO NOT CARE TO PROCEED.